In 2012, Schwerpunkt essentially took a year off with regards to their Rally Point line of themed scenario packs, publishing a Rally Point that consisted of a “best of” set of scenarios from the early years of Schwerpunkt. 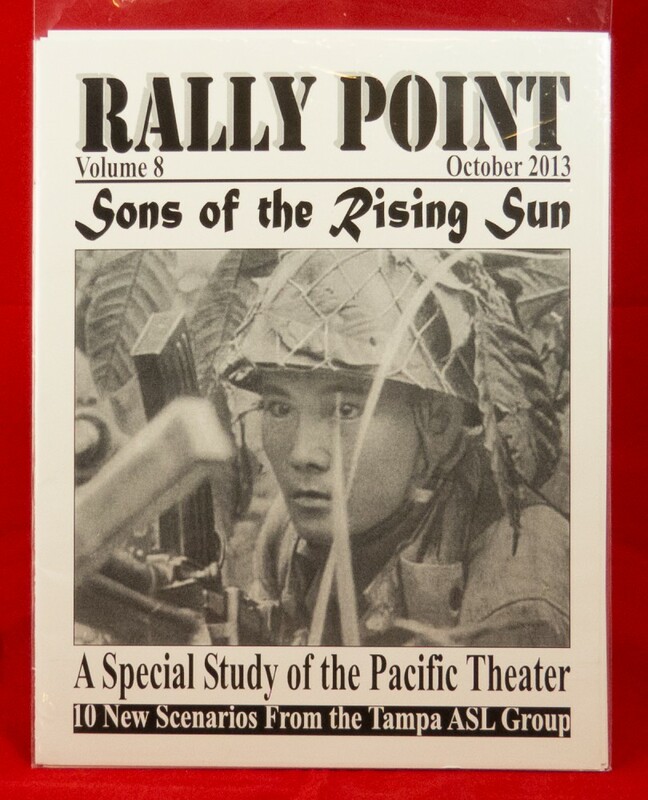 In 2013, Schwerpunkt returned with a new Rally Point scenario pack (RP8) sporting a PTO theme, anticipating the publication of MMP’s Rising Sun (its combined reprint of Code of Bushido and Gung Ho!). For many ASLers, this was a welcome release, as PTO-themed scenario packs have historically been in relatively short supply–PTO is essentially the red-headed stepchild of ASL (which makes DTO the mutant baby kept locked in the basement). The release is all the more remarkable because Schwerpunkt has not traditionally been overfond of the PTO and it typically gets short shrift among Schwerpunkt scenarios. All scenarios feature the Japanese. Their combatants include the Chinese, Americans, Indians, French, Gurkhas, British, and Australians. Three of the scenarios feature the Chinese, but only two feature Americans (no USMC at all). The actions depicted take place in Burma 1942 (3) and 1944 (2), Bataan 1942, New Guinea 1942, Vietnam 1945, and China 1937 (2). 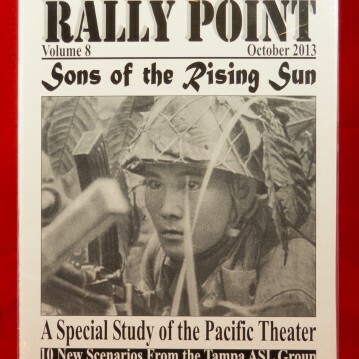 The scenario mix is traditional Schwerpunkt in one respect: Schwerpunkt tends to cast a blind eye to the entire Southwest Pacific Theater after Buna and before the landings in the Philippines. However, it is nice to see Schwerpunkt reach onto the Asian mainland for a few scenarios. The scenarios are mostly small in size; a few managed to just claw their way into the medium range. No scenarios are large. With few vehicles, most of the scenarios will play quite quickly. One scenario, RPT75 (Strike the Seventh), uses Night Rules; this is also one of the relatively meaty scenarios. It also features (drained) Rice Paddies. No scenarios use OBA or Air Support. Boards (collectively) required include 2, 22, 35, 36, 38, 39, 46, 49, 61, 62, 2a, and 5a. RPT72 (Yangtze Doodle), despite its horrific title, is a scenario (set in the battle for Shanghai in 1937) that provides an interesting tactical situation but which can be played very quickly–a good option for those with limited time. From arbitrary left to right, the scenario places 6 Chinese squads, 3 Japanese squads, 4 Chinese squads and a hero, and 2 Japanese squads and a crew, soon to be reinforced by 4 more squads. To win, the Japanese must capture a bridge and clear out the middle Chinese force. The Chinese must hold on in the middle and attack with their “lefthand” forces to get to the bridge before the Japanese attack does. The other Japanese force must hold off this Chinese attack, although it also has the option to lend a hand to the main Japanese attack. Thus in this very small scenario both sides get to attack and defend and must make difficult decisions. Very few scenario can boast of this. It is very fun and seems to be balanced, too. The other Shanghai scenario, RPT71 (The Monetake Mambo), is much more prosaic. Victory hinges on control of 5 buildings, at least 3 of which the Japanese need to win. Both sides essentially enter from offboard and make a rush for the buildings they can reach, then slug it out over what will usually be two buildings. The only ringer in the mix is a HIP Chinese squad with an HMG, which can try to retreat to support the main effort, or cause casualties among the Japanese rushing on the board. 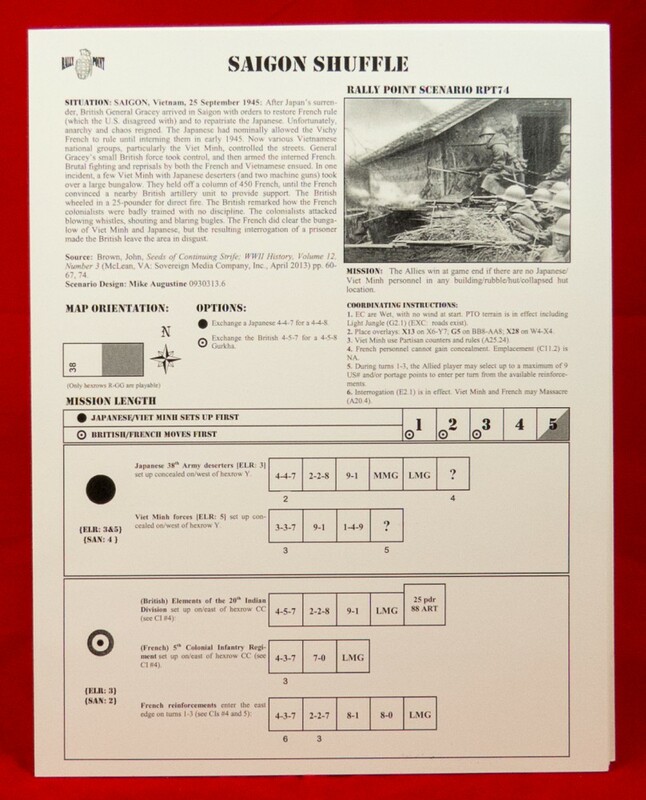 The third Chinese scenario, RPT78 (Bounty Hunters) depicts almost the same action they earlier portrayed in Schwerpunkt 11’s SP128 (Rupee Reward); apparently, after designing a few hundred scenarios one starts to forget them. However, since it uses Board 2a, it has a rather different feel. The scenario is interesting in that, even though it is relatively small, there tends to be several tiny battles going on at the same time on different parts of the map. The real problem for the Chinese is that they need their two crappy little tanks to help them cross the annoying open ground, but almost everything in the Japanese OB seems to be able to utterly destroy the tanks. RPT77 (Go Tell It to the Mountain), a Bataan 1942 scenario, has an interesting SSR. Starting on Turn 2, the Filipino player may turn one of his units fanatic every game turn. One other scenario, RPT74 (Saigon Shuffle), also looks interesting. The scenario, which takes place in Vietnam after the Japanese surrender, features an Indian/French attack on a combined group of Viet Minh and Japanese Army deserters. Novelty value alone almost demands that this scenario be played. The lack of meaty scenarios is a drawback, but overall this is a nice scenario pack with some interesting scenario situations that so far seem pretty well-balanced. It is definitely worth a look.